If all goes according to plan, the unmanned, $163 million Phobos-Grunt mission should reach Mars by autumn 2012, then drop its lander onto Phobos a few months later. The potato-shaped moon is just 16 miles (27 kilometers) long, and most scientists think it's a former asteroid captured by Mars' gravity long ago. The robotic lander will scrape up some Phobos soil, then launch the samples back to Earth, where they should arrive sometime in 2014. Some instruments will stay behind on the moon to carry out scientific observations. Scientists would likely be eager to sift through the Phobos samples. Asteroids are leftovers from the solar system's early days, primordial pieces that didn't get incorporated into planets. So studying pristine chunks of an asteroid is almost like having access to a time machine, researchers have said. Also, some of the dust collected by Phobos-Grunt could come from Mars itself, blasted off by meteorite impacts. So the mission could teach researchers about the Red Planet's early history and evolution as well. Phobos-Grunt is also carrying several other payloads, including a capsule full of microbes prepared by the nonprofit Planetary Society in the United States to investigate how lifeforms survive and behave on long flights through deep space. The mission is also ferrying China's first Mars probe, a small spacecraft called Yinghuo 1 that will separate from Phobos-Grunt and go into orbit around the Red Planet. This is a full-scale mockup of Russia's Phobos-Grunt. The spacecraft will collect samples of soil on Mar's moon Phobos and to bring the samples back to Earth for detailed study. Russia has a long, proud history of spaceflight accomplishments, and its Soyuz spacecraft are currently the vehicles NASA uses to launch its astronauts into space. But the country hasn't had much luck with planetary science missions in the last few decades. For example, the Phobos 1 and Phobos 2 spacecraft — launched just days apart in July 1988 — both suffered critical failures before fully accomplishing their mission goals. And the Mars 96 mission crashed into the Pacific Ocean just minutes after blasting off in November 1996. The United States, meanwhile, kept launching Mars missions that mostly went off like clockwork. NASA dropped the twin Viking landers onto the Martian surface in 1976, for instance, and sent a succession of rovers to the Red Planet, including Spirit and Opportunity, which touched down in 2004. And NASA's Phoenix lander discovered conclusive evidence of water ice on Mars in 2008. 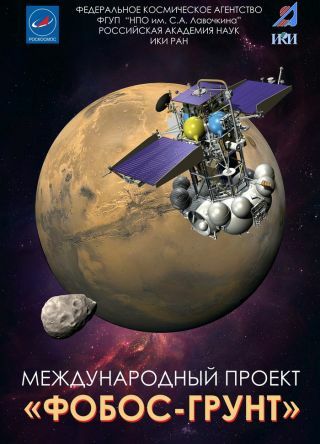 If Phobos-Grunt succeeds, the mission could keep Russia's painful memories firmly in the background, announcing to the world that the nation is a major player in deep space science once again. But success is far from guaranteed, researchers say. "This is really a very difficult project, if not the most difficult interplanetary one to date," Phobos-Grunt lead scientist Alexander Zakharov told Reuters. "We haven't had a successful interplanetary expedition for over 15 years. In that time, the people, the technology, everything has changed. It's all new for us; in many ways, we are working from scratch."